This article is about electric signals via wires. For an immunological model that attempts to explain how T cells survive selection during maturation, see Differential Signaling Hypothesis. 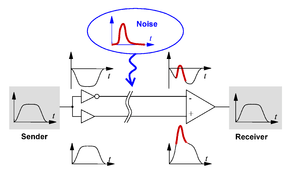 Elimination of noise by using differential signaling. Differential signaling is a method for electrically transmitting information using two complementary signals. The technique sends the same electrical signal as a differential pair of signals, each in its own conductor. The pair of conductors can be wires (typically twisted together) or traces on a circuit board. The receiving circuit responds to the electrical difference between the two signals, rather than the difference between a single wire and ground. The opposite technique is called single-ended signaling. Differential pairs are usually found on printed circuit boards, in twisted-pair and ribbon cables, and in connectors. Provided that the source and receiver impedances in the differential signaling circuit are equal, external electromagnetic interference tends to affect both conductors identically. Since the receiving circuit only detects the difference between the wires, the technique resists electromagnetic noise compared to one conductor with an un-paired reference (ground). The technique works for both analog signaling, as in balanced audio—and digital signaling, as in RS-422, RS-485, Ethernet over twisted pair, PCI Express, DisplayPort, HDMI, and USB. In a system with a differential receiver, desired signals add and noise is subtracted away. The electronics industry, particularly in portable and mobile devices, continually strives to lower supply voltage to save power and reduce emitted electromagnetic radiation. A low supply voltage, however, reduces noise immunity. Differential signaling helps to reduce these problems because, for a given supply voltage, it provides twice the noise immunity of a single-ended system. To see why, consider a single-ended digital system with supply voltage . The high logic level is and the low logic level is 0 V. The difference between the two levels is therefore . Now consider a differential system with the same supply voltage. The voltage difference in the high state, where one wire is at and the other at 0 V, is . The voltage difference in the low state, where the voltages on the wires are exchanged, is . The difference between high and low logic levels is therefore . This is twice the difference of the single-ended system. If the voltage noise on one wire is uncorrelated to the noise on the other one, it takes twice as much noise to cause an error with the differential system as with the single-ended system. In other words, differential signalling doubles the noise immunity. This advantage is not directly due to differential signaling itself, but to the common practice of transmitting differential signals on balanced lines. Single-ended signals are still resistant to interference if the lines are balanced and terminated by a differential amplifier. In single-ended signaling, the transmitter generates a single voltage that the receiver compares with a fixed reference voltage, both relative to a common ground connection shared by both ends. In many instances single-ended designs are not feasible. Another difficulty is the electromagnetic interference that can be generated by a single-ended signaling system that attempts to operate at high speed. The technique minimizes electronic crosstalk and electromagnetic interference, both noise emission and noise acceptance, and can achieve a constant or known characteristic impedance, allowing impedance matching techniques important in a high-speed signal transmission line or high quality balanced line and balanced circuit audio signal path. The latter can be considered as a PCB implementation of the well-known twisted-pair cable, a common implementation of the differential pair. Differential pairs generally carry differential or semi-differential signals, such as high-speed digital serial interfaces including LVDS differential ECL, PECL, LVPECL, Hypertransport, Ethernet over twisted pair, Serial Digital Interface, RS-422, RS-485, USB, Serial ATA, TMDS, FireWire, and HDMI etc. or else high quality and/or high frequency analog signals (e.g., video signals, balanced audio signals, etc.). The type of transmission line that connects two devices (chips, modules) dictates the type of signaling. Single-ended signaling is used with coaxial cables, in which one conductor totally screens the other from the environment. All screens (or shields) are combined into a single piece of material to form a common ground. Differential signaling is used with a balanced pair of conductors. For short cables and low frequencies, the two methods are equivalent, so cheap single-ended circuits with a common ground can be used with cheap cables. As signaling speeds become faster, wires begin to behave as transmission lines. Differential signaling is often used in computers to reduce electromagnetic interference, because complete screening is not possible with microstrips and chips in computers, due to geometric constraints and the fact that screening does not work at DC. If a DC power supply line and a low-voltage signal line share the same ground, the power current returning through the ground can induce a significant voltage in it. A low-resistance ground reduces this problem to some extent. A balanced pair of microstrip lines is a convenient solution, because it does not need an additional PCB layer, as a stripline does. Because each line causes a matching image current in the ground plane, which is required anyway for supplying power, the pair looks like four lines and therefore has a shorter crosstalk distance than a simple isolated pair. In fact, it behaves as well as a twisted pair. Low crosstalk is important when many lines are packed into a small space, as on a typical PCB. High-voltage differential (HVD) signaling uses high-voltage signals. In computer electronics, "high voltage" normally means 5 volts or more. SCSI-1 variations included a high voltage differential (HVD) implementation whose maximum cable length was many times that of the single-ended version. SCSI equipment for example allows a maximum total cable length of 25 meters using HVD, while single-ended SCSI allows a maximum cable length of 1.5 to 6 meters, depending on bus speed. LVD versions of SCSI allow less than 25 m cable length not because of the lower voltage, but because these SCSI standards allow much higher speeds than the older HVD SCSI. The generic term High-voltage differential signaling describes a variety of systems. Low-voltage differential signaling or LVDS, on the other hand, is a specific system defined by a TIA/EIA standard. ↑ Graham Blyth. "Audio Balancing Issues". Professional Audio Learning Zone. Soundcraft. Retrieved 2009-08-25. 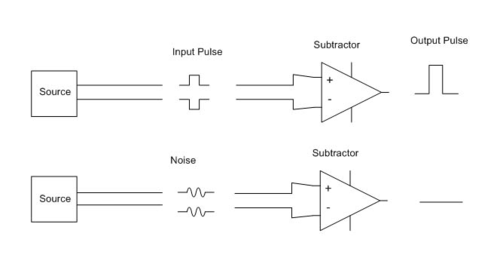 Let’s be clear from the start here: if the source impedance of each of these signals was not identical i.e. balanced, the method would fail completely, the matching of the differential audio signals being irrelevant, though desirable for headroom considerations.